Taiyuan is the capital city of Shanxi Province. Located in the center of the province, it is also the political, economic and cultural center of Shanxi. 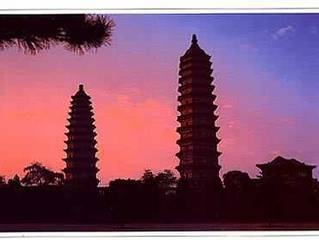 Taiyuan is a city bounded on three sides by mountains. It has a long history and in ancient times was an important military town. At present, Taiyuan is one of China's heavy industrial cities and account for more than half the national coal mining output. Taiyuan also has a wealth of tourist attractions and notably among these is the Jinci Temple. This is the city's most attractive temple although the Shuangta Si (Twin-Pagoda Temple) has become a symbol of Taiyuan on account of its unique architecture. Another major attraction is the Tianlong Shan Stone Caves where magnificent sculptures dating from the Tang Dynasty (618-907) may be seen. The gourmand should be aware that Shanxi noodles are highly reputed all over China, as well as the local vinegar. Other local delicacies are the Tou Nao, the Steamed Dumpling, Sausages and Mutton Soup. To accompany these wholesome foods there are Fen Jiu (Fen Wine) and Zhuye Qing (Zhuye Qing Wine). As well as its cuisine the city is noted for products such as finely crafted lacquer ware. While the local emphasis is upon heavy industry certain aspects of city life such as cultural development has suffered from some neglect. This could be a problem and needs action to be taken.